Known primarily for older titles, Discotek Media has gotten into releasing more recent series over the past few years including a few sports series announcements in the last couple months – first with announcing in December that they plan to put out subtitled sets of the 1st and 2nd seasons of Yowamushi Pedal and then tonight saying they will produce a subtitled-only set of Free! season 1 in 2015 with a possible dubbed version down the road that may come from another publisher. 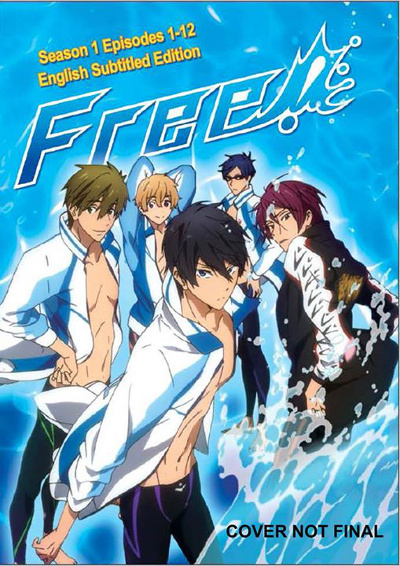 FUNimation had previously simulcast the 2nd season of Free!, Free! Eternal Summer, and plans to release it on home video with an English dub. The main characters’ English voice actors were announced in November. The split licensing of this popular swimming franchise is a bit of an unusual case since most times when there’s multiple seasons of a particular series that are localized, they all get released on DVD and/or Blu-Ray by the same publisher. I personally have only seen the first couple episodes of the first season of Free! but I imagine it’s frustrating to fans who want to own both seasons to have different publishers working on them.